This grey, crustose, maritime lichen with rust-brown discs is only likely to be confused with C. crenularia (described elsewhere) since they both occur on siliceous coastal rocks where their habitats overlap. To differentiate them, it is best to examine the discs closely for two key characters. In C. ceracea the margin of the disc (exciple) is dull and matt when dry. Also, the discs when wetted become greenish. In C. crenularia the dry disc exciple is smooth and shiny and when wetted the discs remain rust-red. It is frequent in suitable habitats throughout Ireland but rarer in the south and south-east. The disc when wet turns greenish. Simms, M. J., (2016). 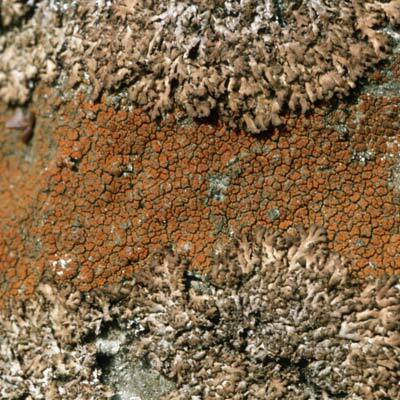 Caloplaca ceracea J.R.Laundon . [In] LichenIreland.